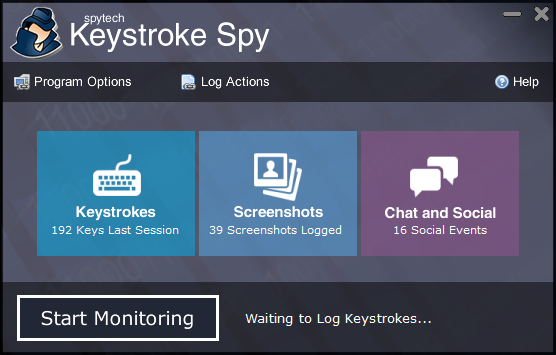 Keystroke Spy is an extremely powerful cost-effective alternative to our robust, all-in-one computer monitoring product - SpyAgent. Keystroke Spy, while being able to capture screenshots and log all keystrokes typed by users without them knowing, can also be set to log keystrokes typed only in specific applications. While allowing you to see who users are talking to, what websites they visit, emails they send, and more, Keystroke Spy can also be configured to email you when users type specific keywords - such as names or addresses. Keystroke Spy can only be installed on computers you own and have authorization to monitor. Purchase Keystroke Spy today and start monitoring your computer in minutes. Your download is available immediately after purchase so you can install and start using Keystroke Spy right away! System Requirements Keystroke Spy FAQ Keystroke Spy's Awards Stealth Edition Monitoring Software Compare Software Why Spytech?